This is an all around farm dog that handles many jobs. The Briard was a partner to the shepherd, relying on intelligence and its independent nature to get those tasks done. He was a family dog as well, going home at night to watch over the family and guard their household. The Briard is a loose-eyed, upright breed with a natural tendency to gather and fetch, bringing the cattle to the handler. They tend to circle when they work livestock and some will bump and shoulder stock. They tend to turn stock from the head rather than the heels. 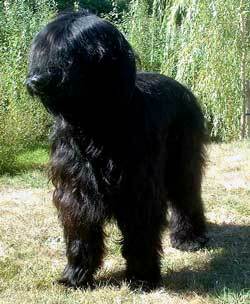 Briards are large muscular herding dogs with a long coarse black, gray, or tawny coat. Males are 24-27 inches at the withers and weigh 70 to 80 pounds. The slightly smaller females stand 22-25 inches and weigh 65 to 75 pounds.